British Psychotherapy Foundation hosts regular art exbitions at our office at 37 Mapesbury Road. It is a platform for our members, trainees and staff members of the bpf to present their work - either painting, ceramic or some small sculpture. 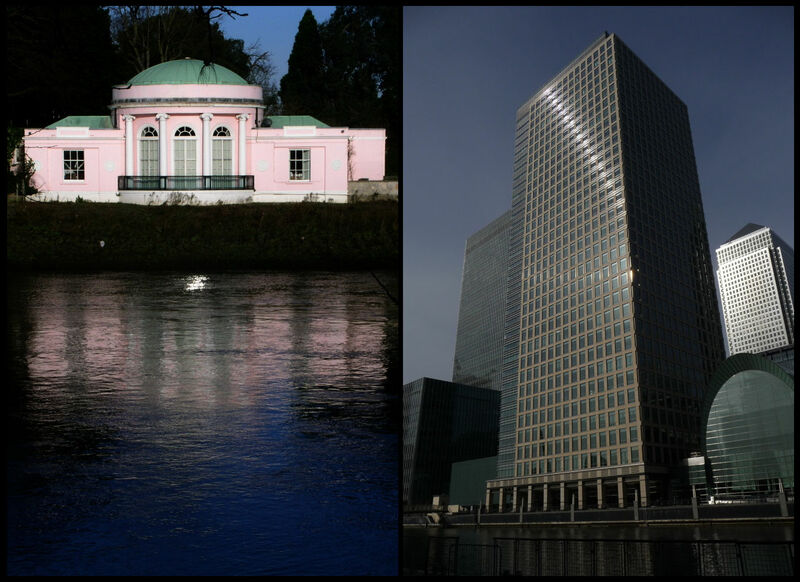 As the bulding is not open to the public viewings have to be arranged directly through contact with the artist. This is the third of a series of exhibitions Linda Brown has held at Mapesbury Road. The first, 'Sol et Luna' mainly focussed on paintings of the night sky. The second exhibition of original prints was influenced by a personal odyssey to Myanmar in 2012 - the birthplace of her mother and grandmother. This exhibition, 'Aqua Permanens' is a continuation of that odyssey. 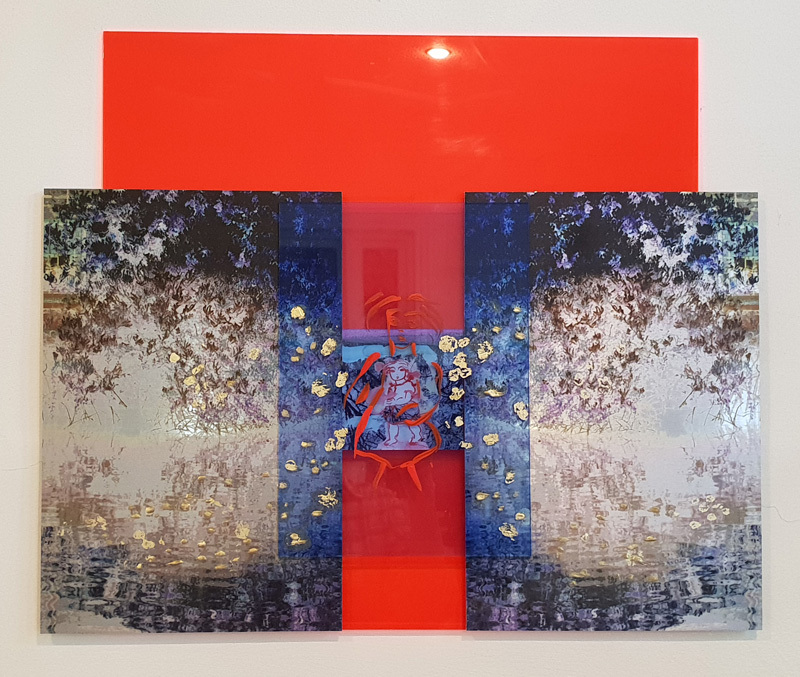 Recent influences include, 'The Examined Life' by Stephen Grosz and 'The Red Book' by CG Jung, which have inspired her to pursue her own work: An enquiry into the depths, the distance, past and future. The landscape and memories of Myanmar continue to influence. 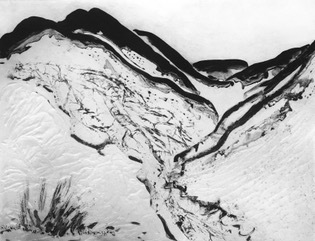 The Shan Hills and the Eastern Plains series of work continuing, developing and evolving through printmaking, painting and glass. Earth and water feature as symbols in a semi abstract way. An integration of art, background in art therapy and analytic practice. The studio/vessel a creative place of experimenting with material and technique, fusing, heat, multi layered plates, embossing texture into damp paper, Chine Collé. Encountering the unexpected, the mire of the deep, the hidden state. Both transformer and transformed. Linda Brown is a Jungian analyst with the BJAA and a member of the bpf in private practice in St Albans.Her interest in Art and psychoanalysis began in 1970 whilst a student at Harrow School of Art. In 1975 having completed a degree in Fine Art at Norwich she trained in Art Therapy. She alsoThis is the third trained as a teacher at The University of London Institute of Education and as a counsellor at the University off Hertfordshire, where she subsequently worked as a professional tutor and supervisor of students in counselling training. During this time she established a private practice in St Albans and later trained as a Jungian Analyst with the BJAA. The exhibition will be on until March 2018 and viewing is by appointment only. 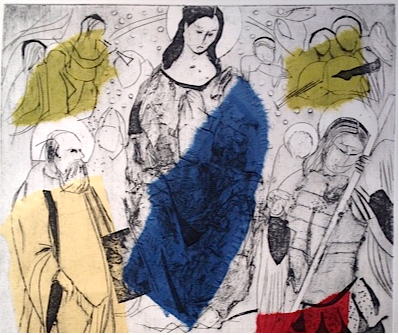 These collagraph etchings are part of a larger religious series I made depicting scenes from the New Testament and used as meditations by Roman Catholics when praying the Holy Rosary. The original inspirations that I have used to base my work come from iconic frescoes, paintings and altar pieces which at some point in my life struck me as beautiful and moving. Card mount board is the base material I use to work up my collagraph plates.The plates are built up through a process of cutting,scoring,tearing and glueing various textures onto the mountboard. These are then sealed with Shellac varnish and allowed to dry. The plate is then inked up with the intaglio technique, as it would be when working on metal plates. The inked-up plate is then put through a printing press, and in this series colour has been achieved by adding 'chine-colleé'. This is a process of adding torn coloured papers which are placed over areas of the plates. Lightly glued, they adhere to the paper when they are run through the press and so become an integral part of the finished print. Mary Cunnell is a Jungian Analyst and member of the BJAA at the bpf. She is in private practice in Maida Vale, London. She trained originally as a Fine Artist and has painted all her life. She has had one person shows at the Arts Council Gallery (Belfast 1982/1993), Riverrun Gallery (Dublin 1995), London Print Workshop (1995) and the Dyehouse Gallery (Waterford 1996). She completed an MA at Chelsea College of Art in 1997. The exhibition will be on until December 2018 and viewing is by appointment only. 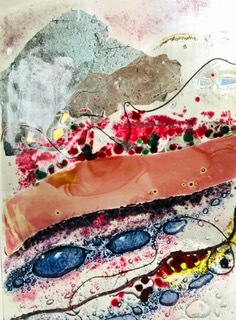 Penny is a retired psychoanalytical psychotherapist (LCP and Lincoln) but has painted all her life and has a studio at The Chocolate Factory, N22, where she has annual Open Studio weekends. She is a painter and printmaker and her images tend to be abstract and semi-abstract. 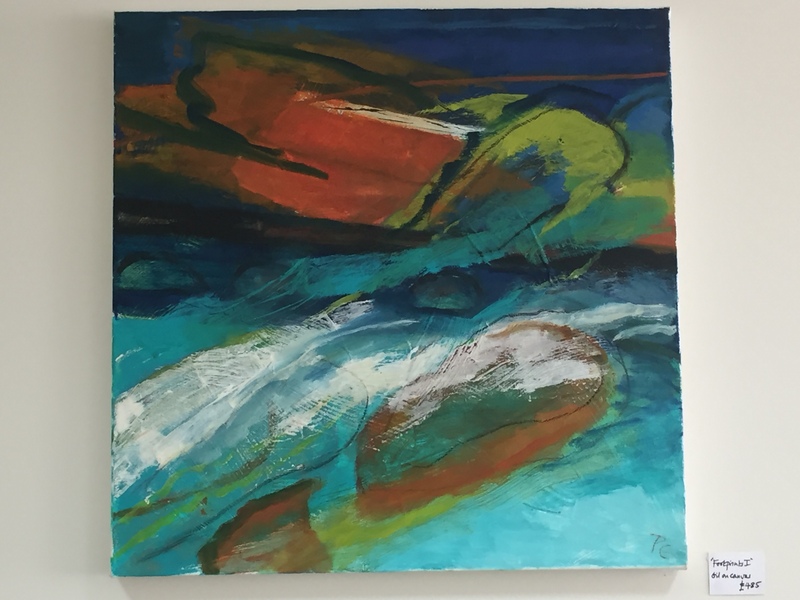 She has had solo exhibitions previously at the Tavistock Centre, London Centre for Psychotherapy, WPF Therapy Centre, Chelsea and Westminster Hospital Gallery, and Karamel Arts Venue, as well as exhibiting in several group exhibitions through East Finchley Open Artists. Penny's work can also be viewed on her website: pennyelder.co.uk or contacted by email (see below). My work originates from a continually developing archive of notes, drawings and photographs from my journeys and observations. For me drawing is a process and technique. My drawings reveal the history of their making. 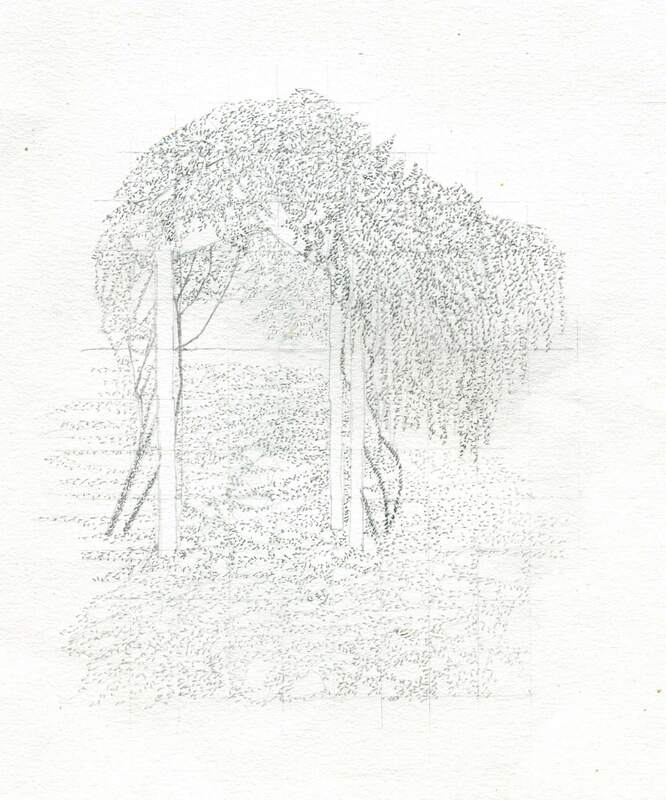 The project has been to produce a collection of drawings and prints of the Edwardian House including its garden, interior and exterior. This work is shown in a curated exhibition at the house. With the agreement of the British Psychotherapy Foundation (bpf) I visited the house periodically to make sketches, take photographs and collect other information which assisted in the production of the prints and drawings and to develop a portfolio which aims to be a documentation of the Edwardian House in reference to its significance as the childhood home of the neurologist, Oliver Sacks, and its current use by the bpf. Steven Mendoza trained as a psychoanalytic psychotherapist qualifying in 1980 and retires from practice this year. Before training he worked as a film editor’s assistant, a market research consultant and a generic social worker and mental welfare officer. His father was a director, editor and writer of sponsored films. He trained as a photographer at the Regents Street Polytechnic and as a film technician with the Crown Film Unit. Steven was brought up with his father’s pictures and tuition, a hand reared photographer, if you like. Digital photography with its ease of post production and multiplicity of shots stimulated him to carry a camera at all times and his pictures are mostly opportunistic snaps. He finds that going out for the purpose of taking pictures is usually unproductive. 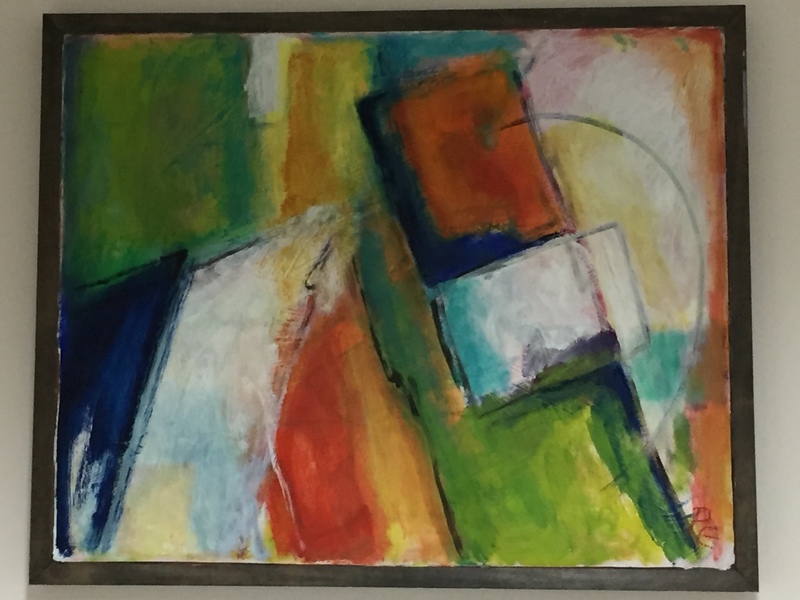 His influences are as much painting as photography and his primary concern is to have a harmony of form, colour and texture over the whole area of the picture. Prints may be ordered at £75 each for prompt postal delivery. Send a description of your selection by email. Johnny Miller was born in 1962 and grew up in Newcastle upon Tyne. From the age of 15 he worked as a cook in a French kitchen and then in the kitchens at St Nicholas’ Mental Hospital in Gosforth. Aged 19 he moved to London and enrolling at art college. Eventually in 1991 he qualified as Master of Printmaking at London’s Royal College of Art. In 1998 he moved to Japan and now lives with his family in the hills overlooking Osaka. 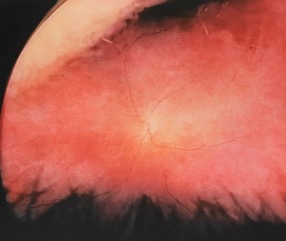 Johnny Miller regularly exhibits his work in Berlin and recently had a solo exhibition in New York. 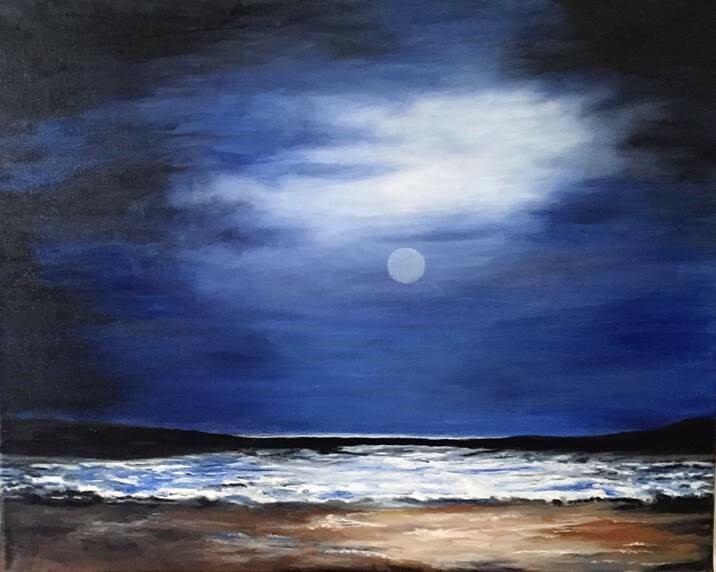 I hope that my “Visions of Light: Day and Night” will brighten up the next few months: paintings of landscapes evoked from many travels to the English countryside bathed in summer light, seascapes from wonderful Iona in Scotland and full moon and sea paintings, highlighting reflections of light and shadow. 'Borderlines' - the art exhibition was at 37 Mapesbury Road until 28 December 2017. The theme of my work for this exhibition is journeys and family journeys. From there, home, to here, exile, from whole to broken, from being a shattered nothing to becoming something new; the delight, pain and strange rejigging of love. When you look at an image you also get what you bring, of course. We collaborate, you co-create with me: that is what my work is for. When something matters I transpose it into an image — that is also the journey of the work and of your engagement. I hope these paintings offer you a sort of mirror.